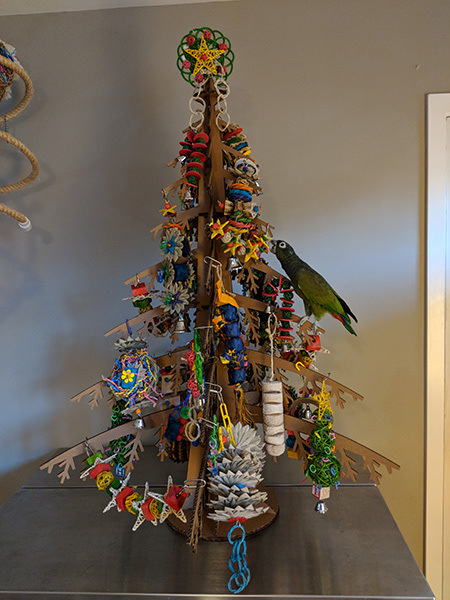 Are you looking for an enrichment idea to include your parrots in the holiday festivities? Why not set them up with their very own, 100% parrot-friendly, chewable, destructible Christmas tree? If you are crafty, or have a laser cutting machine at home that can cut cardboard, you could design and make your own tree base! If you aren’t crafty (like me), or simply pressed for time, Cardboard Safari sells a cardboard tree base. This idea works for other animals, too, including rabbits, guinea pigs, rats, and more. My tree is actually shared by my parrots and house rabbits. They all enjoy chewing, and enjoy chewing on a lot of the same materials. Cardboard Safari has a cardboard tree called the Alpine tree available. It comes in two sizes. The “large” is 22″ wide and 22″ tall. The “giant” is 42″ tall, and 42″ wide at its widest point. I wanted one that would hold a lot of toys for my five parrots and two house rabbits, so I went with the giant size. I have now owned two different models of cardboard Christmas trees. The first one was from Form by Heidi, but doesn’t appear to be manufactured any longer. The tree bases have a few things in common that I am happy to share, for those of you crafty enough to make your own. The first tree I had, by Form by Heidi, has six identical panels that make up the trunk and branches. The Cardboard Safari tree has five identical panels to make up the trunk and branches. In both cases, they have three circular anchors with slots. The five or six panels all connect to the circular anchors. Cardboard Safari has a cardboard base the panels fit into as well, for added support. The Cardboard Safari tree can be assembled in minutes. It’s very simple, and fun to put together. It honestly took me longer to find and clear a good spot for the tree than it took to put the tree together. If you have kids, or family visiting from out of town, setting up a tree for the pets is a wonderful bonding activity! I enlisted the assistance of my Dad and my nephew in putting the tree together on Thanksgiving. Optional: Decorating the tree with toys! You could leave the tree undecorated, and it’d still be a fun piece of decor, and can serve as a great cardboard toy itself. Or, you can add even more interest to it for the birds by decorating it with toys! Like the tree itself, you can either make or purchase toys to decorate your tree. I have no doubt there are lots of crafty parrot owners who could make some beautiful garlands, toy decorations, and foraging opportunities for their parrot Christmas trees! I simply went through Phoenix Landing’s Helping Parrots online store and bought toys to hang on the tree. They even have some Christmas themed toys! Try to keep the tree balanced. So, if you are hanging a slightly heavy, wood block toy on one side, try to balance it out on the other, too, so the tree doesn’t lean slightly. My birds enjoy checking out the tree. It’s intriguing, perhaps, to see so many toys they can destroy in one place! Please keep in mind that the tree is completely destructible, though, too. So, do not leave them unattended with it. Otherwise, it may very quickly become structurally unsound if you have a bird (or rabbit) who loves to chew cardboard. Enjoy the fun and beauty of the tree through the holiday season! This entry was posted in Parrot Enrichment. Bookmark the permalink. ← Is a Parrot the Right Pet for Your Child? That is awesome Michelle. I love it. Thanks for sharing. Thank you so very much, MICHELLE UNDERHILL, for your valuable information. I will copy and paste your article in entirety and save it on my hard drive. I have the manual skills of a dead ferret ergo it’s priceless for me to know both the source of Parrot Christmas trees, their various sizes, and the source for toys to festoon the tree with. I want my huge Macaw to have a wonderful Christmas (he’s 24 years old and we’ve been together since he was 5 days old) and you have made this possible!!! Love it, love it, love it! 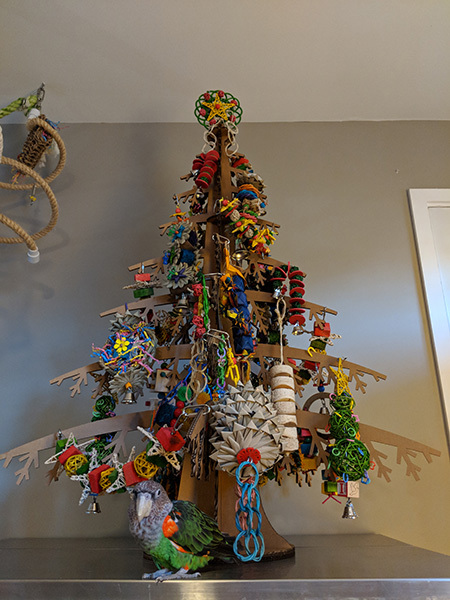 Great post and delighted to see my XMAS toy designs (Super Bird Creations) decorating your tree.